Walsh Construction Company is a Chicago-based general contracting, construction management, and design-build firm. Walsh is recognized as the largest construction firm in Chicago according to Crain’s Chicago Business, as well as one of the nation’s top 15 contractors according to Engineering News-Record (ENR). Walsh thrives on the innovation from their employees but did not have a method to gather and execute those ideas. 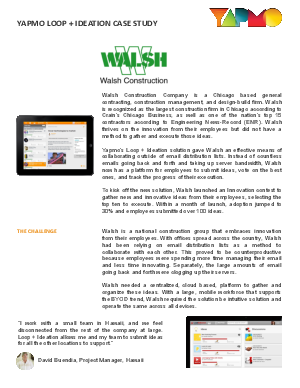 Yapmo’s Loop + Ideation solution gave Walsh an effective means of collaborating outside of email distribution lists. Instead of countless emails going back and forth and taking up server bandwidth, Walsh now has a platform for employees to submit ideas, vote on the best ones, and track the progress of their execution. To kick off the new solution, Walsh launched an Innovation contest to gather new and innovative ideas from their employees, selecting the top ten to execute. Within a month of launch, adoption jumped to 30% and employees submitted over 100 ideas.